Generating demand-centric growth is mission critical for every brand in the world; but how to achieve that growth in a consolidated market is still black magic. Undoubtedly, we live in an era of fragmenting customer needs, and the proliferation of digital “experiences” further amplifies this phenomenon. Not complex enough? Add the fact that in verticals like FMCG and retail the proliferation of new brands is staggering, with new products practically launched on a weekly basis. Are you selling to Millennials or to Generation Z? Then you are dealing with consumers spending on average 40 minutes a day on facebook who are rarely watching TV and who exhibit scarce brand loyalty. In this post, we will explore a novel way that helps you to think differently about your consumers and to develop demand-centric growth for your brand. A powerful antidote preached by the marketing gurus is to run brands as a portfolio. To this end, several models such as Need Space Mapping were developed to determine the fit of your current brand positioning, and to cut resources to the least performing products in your range. For instance, “Socialising out” or “Socialising at home” are key states that every drink brand must fill with an appropriate product. But other important states can also related to food or relaxation. A need state map gives you a framework to work with. Moreover it enables distributed teams within your organisation to focus on the key customer experiences. However, a fundamental step is to learn the association between states and brands in your portfolio / competitive category. 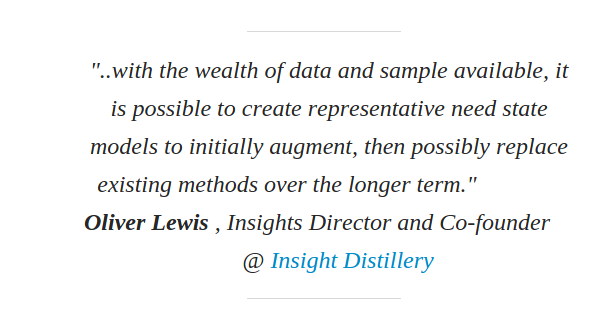 This enables you to validate assumptions you sometimes make based on your own experience and on narrative data. Likewise, you can discover white spots in the market. Addressing such niches is easier if you spot them in a timely manner. Moreover, having the ability to quantitatively assess how strong brands are on a particular state can trigger the right decisions about your portfolio. 3. List the needs emerging in each state. Visual data spontaneously shared by your consumers give you a great opportunity to explore a specific state of interest. For instance, the two Instagram posts below describe the consumption states “Socialising Out” and “Socialising at Home” better than any report. By quickly scanning consumer photos you can immerse yourself in the customer experience and you can deduce what are the features that make your product irresistible. Moreover, by reading the associated conversations you can find further evidence for your assumptions. In the past, need states were created one-off, as a result of expensive ethnographic studies and in-depth interviews. Today, you can create need state maps in a matter of hours through a combination of smart analytics digging into the billions of posts spontaneously shared by your consumers. Interested in getting a need state map for your brand to develop demand-centric growth?